Here’s a list of all the menus in Artisan for better accessibility. Besides the main menus in the center of the Artisan screen, you can use the traditional pull-down menus from the menu bar along the top of the main window, just below the title bar. 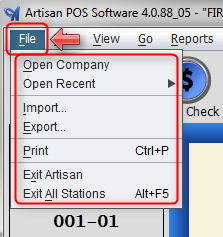 Most of these menu entries are simply shortcuts to various parts of the program, which can also be reached through Artisan’s traditional Main Menu system. One advantage of the pull-down menus is that you don’t have to escape back to the Main Menu first. Selecting a navigation shortcut pull-down will cancel whatever you’re currently in the middle of, but unlike “super-escape” (Shift-F12, or in some cases, Shift-Esc), you’ll be prompted for confirmation if you have any unsaved changes. See all images below for a reference. The File Menu lets you open a new company file (same as Change Directory in System Administration), open a recent company database, import or export data, print the current record or list, or exit the program. 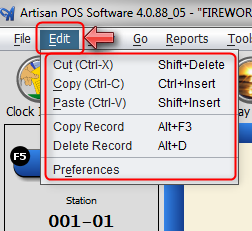 The Edit Menu lets you Cut, Copy and Paste text or Copy/Delete an entire Record, where applicable. Select “Preferences” to go directly to the Configuration Settings menu. 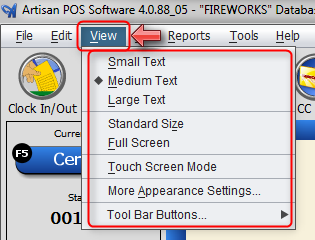 The View Menu lets you control how the main Artisan window is displayed; specifically, the size of the window. Select Small Text, Medium Text, or Large Text to change to one of several built-in sizes. Select Standard Size to make Artisan window take half screen size. Select Full Screen to make the Artisan window take up the entire screen. The touch Screen Mode enables Artisan to function at your fingertips if your PC / Monitor is touchscreen compatible. You can also use the View Menu to control fonts and Main Menu pictures, or to switch color schemes under More Appearance Settings. 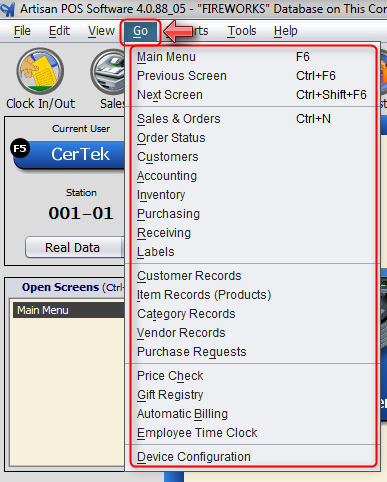 The Tool Bar Buttons allow you to display or not to display the tool bar icons such as Clock IN/Out, Sales, Price Check etc…. The Go Menu lets you quickly navigate to various main sections of the program. 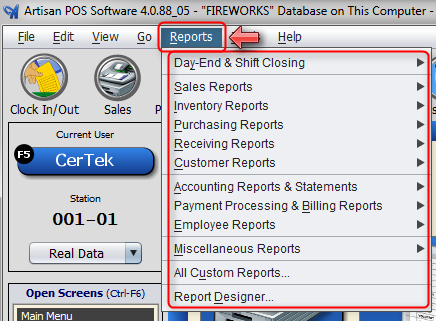 The Reports Menu lets you quickly navigate to the various reports in different areas of the program. Look through them and use them according to your needs. 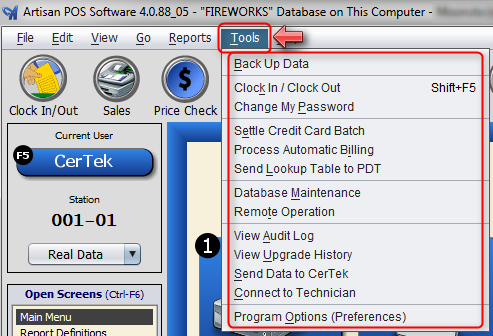 The Tools Menu lets you perform various important maintenance tasks, such as all the ones displayed under the Tools Menu. You may also select the option Connect to a Technician after speaking with us by phone or email, so that we may access your PC/Server/Register Remotely to assist with any issues that you may be facing. 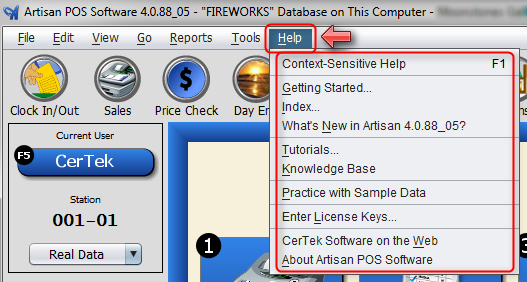 The Help Menu lets you select common help topics, the help index, or tutorials. The “Enter License Keys” entry lets you administer your current Artisan license keys, or add new ones, to enable optional features.